Though modest in size and in parts radically altered. Shotton Hall represents a fine example of a mid 18th century country house and is one of only a few still surviving in the area. Its importance as a building of architectural and historical interest has been acknowledged by being listed as a Grade Two Protected Building. This listing was made on 5th of July 1950. Unfortunately, it cannot be seen in its original splendour but its history and indeed its very fabric, are a record of the changes which have taken place in the district right up until the present time. The land upon which the Hall is built belonged to the Thompson family from the reign of Elizabeth I until the marriage of the family’s heiress, Elizabeth, to Charles Brandling in 1756. The Thompson family were gentlemen farmers from the area and the Brandlings were merchants and entrepreneurs from Gosforth. This marriage was not only a joining together of families, but the joining of an old agricultural land owning family to a family which was to play an important part in the industrial revolution, which changed the economy and the social structure of the whole area. Originally the Hall was built as a residence for the newly married couple, and it was erected in the ideal situation to control the management of the southern limits of the Brandling’s land holdings. During these early years the formal woodlands, which still exist were gradually introduced. It is unlikely that any woodlands, previously existed on the site because the majority of the species of the trees now standing are not common elsewhere in the area. It is noteworthy that the woodland has always been properly maintained by its various owners, even up to the present day. 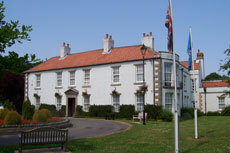 The influence of the Brandlings family in the area increased and eventually they became the largest landowners in the district, and with their ever increasing fortunes, Shotton Hall flourished, New servants accommodation and kitchens were added around 1820 and the interior of the building was completely remodelled. The only part of the original interior still remaining intact, is the main staircase. However, the Brandlings influence and fortune was not continue for much longer. Charles Brandling, born 1798 and the last of his lie, was not as successful as his predecessors and was ruined by speculation in coal mining in the Haswell area. To satisfy his creditors, he was forced to sell his estate, including the Hall, to the Shotton Coal Company in 1850. Ironically, the main consideration of the Shotton Coal Company in purchasing the Hall and its grounds, was not for the Hall itself, but for the rich coal reserves underneath it and for almost a century the coal continued to be worked away from these lands. With the working of the coal, the topography of Shotton Hall has been much changed and it is estimated by The National Coal Board that the Hall and the grounds in parts, have been sunk between 10 to 20 feet because of subsidence. After having been acquired by the Shotton Coal Company, it appears that the Hall passed into the possession of the Burdon family. Through the exact date this happened is uncertain, there is a recorded Deed of Gift to the Reverend John Burdon in 1880. It is likely that the Hall continued to be occupied by the Burdons and their related family., the Sclater-Booths, or let out to tenants until the 1939/45 war when the property was requisitioned by the War Office. From enquiries at the Country Archivist Office at Durham, the records show that the Hall was occupied when the census of population was taken in 1841, 1851 and 1861. In 1871 and 1881, the premises were recorded as unoccupied, Appendix ‘B’ shows the names of the persons resident in the Hall was above census were taken. During the war, the Hall was used, it is understood, as an anti-aircraft searchlight battery. At the end of the war, the Hall was purchased by the Horden Collieries Company Limited, and when the Company was nationalised, the Hall came into the ownership of the National Coal Board but by 1948 the building had become almost derelict. Again, the Hall was to take a major part in the development of the area when it became the offices of the Peterlee Development Corporation in 1949/50. It was refurbished by the Corporation a cost, when expressed in current prices, approached a quarter of a million pounds. Throughout the period of its occupation by the Corporation (1949/77), the Corporation was forced to maximise its use by the addition of further offices and canteen facilities, etc. Because of this, mush of what remained internally of the original building and the 19th century alterations disappeared, but to the credit of the Corporation, external fabric and the formal gardens were restored as far as possible to their original condition. In 1948 , when the Corporation was formed, there was genuine excitement and notable people were drawn to the area from Government and artistic circles. The famous Topoloski came and sketched Shotton Hall refurbishment getting under way. Even when the Corporation vacated the building in 1977 to move to its new premises in Peterlee Town Centre, the Hall still had an important role to play. During the fireman strike in November 1977, the building was occupied by the Amy Flying Column of the 8th Signals Regiment and became the emergency fire fighting station for the South Durham Area. In 1984, with impending demise of the Peterlee Development Corporation, the Hall was sold to the Peterlee Town Council. By this time, the Hall had again come into disrepair but it was felt that it should be preserved for historical reasons. The town Council restored the fabric of the Hall and carried out rewiring and internal repairs, heating and refurbishment, trying as far as possible, to retain as much as possible of its original character. The single-storey service wing and the late 20th century addition (which was not of special interest) was demolished. This was replaced with Banqueting Suite. In October 1987, the Town Council moved into the Hall. It is now used as their offices and meeting rooms. The Hall also provides facilities for civil wedding ceremony and conferences. The Banqueting Suite has recently been extended and is available for private functions. However, as all good old houses have their ghosts, Shotton Hall has its own ‘Grey Lady’. Although entirely undocumented, it would appear that some unfortunate serving girl took her own life after an indiscretion with one of the masters of the Hall and to this day she still asserts her presence in the Hall, especially on and around the back stairs leading to the former servant’s quarters. It was from the handrail of these stairs that the poor girl hung herself.